Edward Reynolds was a bishop of Norwich in the Church of England and an author. He was born in Holyrood parish Southampton, the son of Augustine Reynolds, one of the customers of the city, and his wife, Bridget. In 1615, Reynolds became postmaster of Merton College and in 1620, probationer fellow. In 1622, he was made preacher at Lincoln’s Inn, from 1627 to 1628 served as the thirty-seventh vicar of All Saints’ Church, Northampton, and in 1631 rector of Braunston, also in Northamptonshire; but in the rebellion of 1642 he sided with the Presbyterians. In 1643 he was one of the Westminster Assembly divines, and took the covenant in 1644. 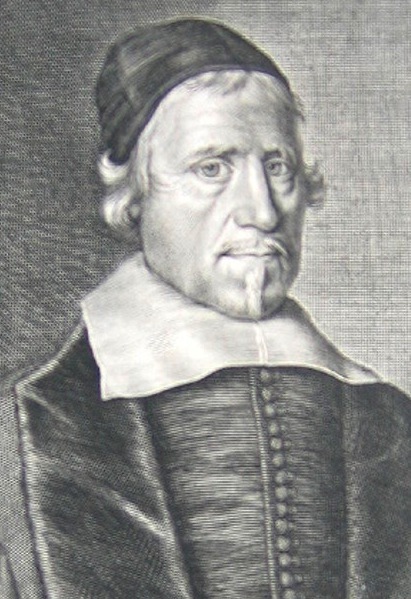 In 1648 he became dean of Christ Church and vice-chancellor of the University of Oxford. He refused the engagement (1651) and despite his promise of obedience to the law, but not subscription to the oath in Humble Proposals of Sundry Learned and Pious Divines (1649), this was insufficient to save him; he lost the vice-chancellorship in September 1650. He was ejected from his deanery the following March, despite a last minute pledge to subscribe in a limited sense. He preached before parliament in January 1657, and the same year he became vicar of St Lawrence Jewry, London, but was restored to his deanery in 1659. After the death of Oliver Cromwell, he and other presbyterians sought an accommodation with Richard Cromwell, and on 11 October 1658, on behalf of himself and other London presbyterian ministers, Reynolds delivered an oral address to the new protector. In 1659 he preached at the opening session of parliament, and his sermons to parliament and London notables throughout 1659 and 1660 became increasingly pointed about the need for peace, unity, and moderation, codes for the restoration of the monarchy and accommodation with episcopalians. The Vanity of the Creature. A detailed exposition of Psalm 110. Seven sermons on Hosea 14. Meditations on the Holy Sacrament of the Lord’s Supper. Meditations on Peter’s Betrayal and Restoration.